I’ve written about my husband Geoff’s spinal cord injury anniversary on January 29 before, and in the world of Google, one would think I could track it down. No luck. 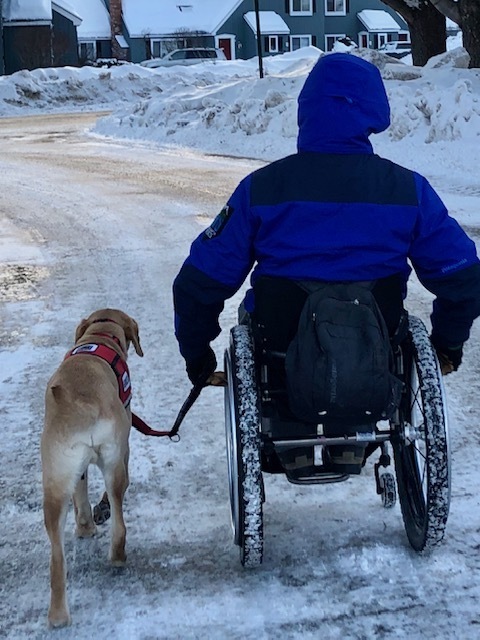 But this year, the same week we honor his 24th year of being a T7-8 paraplegic and the work he’s done since sustaining that injury, we happily also get to celebrate the one-year anniversary of the arrival of our NEADS service pup Sir Emerson Gronk Snowy Krill. I never knew Geoff before he injured himself snowmobiling all those years ago now. But we met around his 10th anniversary, and he sure hasn’t slowed down since. One year ago, a 2-year-old yellow lab joined our ranks. He turned 3 last week on January 15, and both kids suggested he have a beer since he was 21 in human years. They thought they were hilarious. We gave him his regular dog food and some of his favorite high-value treats and of course many bites of green apples and bananas. He prefers the green apple over the red, like the other members of my family, another fact I find hilarious. At this writing, he is snoring next to me on the couch, taking advantage of some quiet time home with Mum while Dad and the kids are off skiing. Unlike most service dogs who join their partners at work, Emerson can’t very well rip around the mountain while Geoff is teaching skiing. He could probably ride the chairlift, but what would be the point? It would not be safe for him to run all the way down. But let me tell you. He really does love to run. And so, after being cooped up beneath Geoff’s desk over at the ski school office, we bring him home and remove his service dog uniform and go for a good zoom. Zooming is what our family does best. We zoom on skis, sleds, bicycles in the spring and summer. Emerson’s favorite zooms are in the woods by our house, which are very safe, and he zooms up and back and up again, circling back to check on the rest of his family. Sometimes we zoom inside the tennis courts with his other dog friends Andy, Sherbie, Willow, and Juniper. Emerson is the biggest and wants everyone to play as hard as him all the time, at least while the vest is off. It’s hard to remember what life was like before Emerson came into our world. He helps Geoff by picking up his gloves off the floor several times a day, carrying his lunch box, closing, and opening doors, resting his head on Geoff’s lap when he is stressed. He helps our children by snuggling on the couch, letting them read to him, putting them to bed with a buddy, and accompanying us to all of our favorite outdoor activities. To say we love him is the understatement of this entire year. Emerson has a big personality-- the people from NEADS thought he would be a perfect match for Geoff because of he was a seemingly “big world” kind of dog. I love that description. Our world is pretty small but because he is able to go everywhere Geoff goes, our kids always have their best friend with us, and that is remarkable. Our daughter is much better at picking up dog poop than our son, and for the longest time, I thought he was manipulating her that way. But he is the one to make sure that he is always on his leash and the gentle leader is just right and he panics a bit when we take him off leash in the woods that he will run away. And where would we be if he ran away? But he doesn’t and he won’t because we are his people. He needs us to need him as much as we need him to need us. I wonder what dogs remember. Does he remember the prisoner who raised him up from a little guy? Does he have a sense of the puppy raiser family who brought him places like restaurants and movie theaters and let him practice playing with children? In the same way, Geoff acknowledges how different life has been for the past 24 years post-accident, every year is different, each with success and failure. We live in the moment with the people and canines we love best-- taking time to balance the work and the play a little bit each day. Heather Krill is a writer- wife- teacher-mom who lives in the White Mountains of NH with her husband, Geoff, a paraplegic and professional skier, and their two children, Carver and Greta who are 9 and 7. Please check out her novel True North, website www.heatherkrill.com, author FB page Heather Krill, and @heatherkrill1 on Twitter.